Cheddar and pasta. They are like best friends. Has there ever been a combination of two ingredients that I have eaten together more in my life? While cheddar is always the easy go to for mac & cheese are there other options out there, just as worthy of your time – say Gouda maybe? 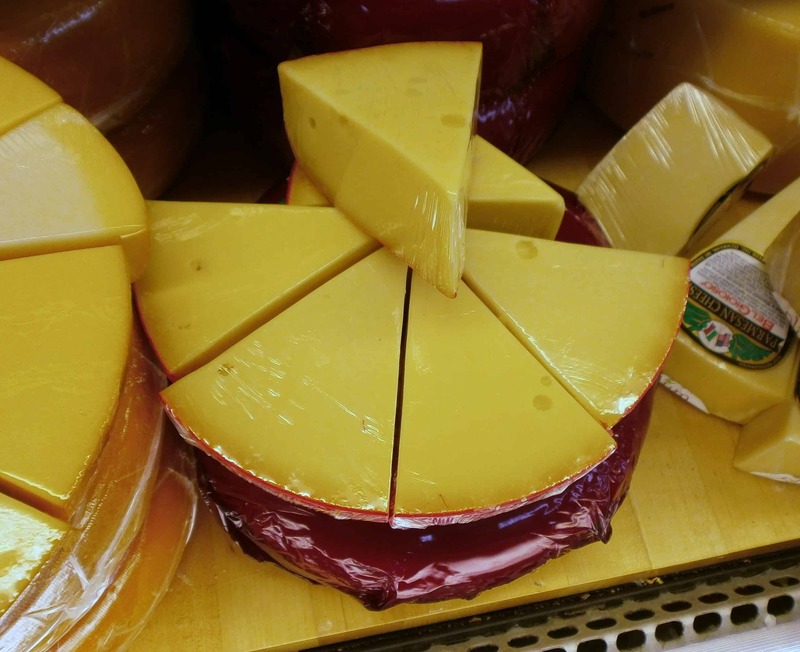 (Learn more about Gouda and how it’s made). This dutch cheese is a beautiful melter that will be an excellent addition to your mac & cheese. It has a certain creaminess that you just don’t find in cheddar cheese. Let me show you how to use it. First, you want to choose something that is going to have some flavor. 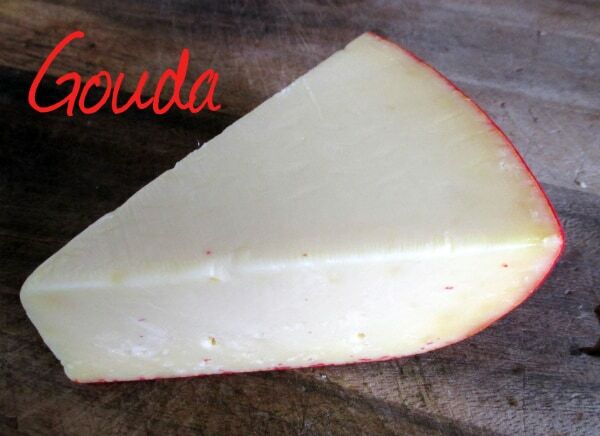 A really young Gouda is great paired up with some crackers but often too mild for mac & cheese. Look for a red wax Gouda that has been aged. It should have a light tan color. I wouldn’t pick something too old either, you want a cheese that is going to melt nicely. If it shreds nicely it should work out just fine. Most of the time you will easily spot the red wax Gouda and that takes all the worries away. If you really want to up the flavor ante, go for a smoked Gouda. Most stores carry them. The smokiness won’t be as pronounced in the final dish as the cheese itself, so it should provide a nice flavor note without overwhelming your taste buds. I would still do light on the smoked first just to be sure you like it. As it related to price, Gouda and cheddar are pretty comparable. You should be able to find Gouda for around $3.99 to $5.99 per pound. Of course there are more expensive Goudas but anything in the given price range should be just fine to produce a quality mac & cheese. I decided to run a little experiment. I made two batches of mac & cheese. 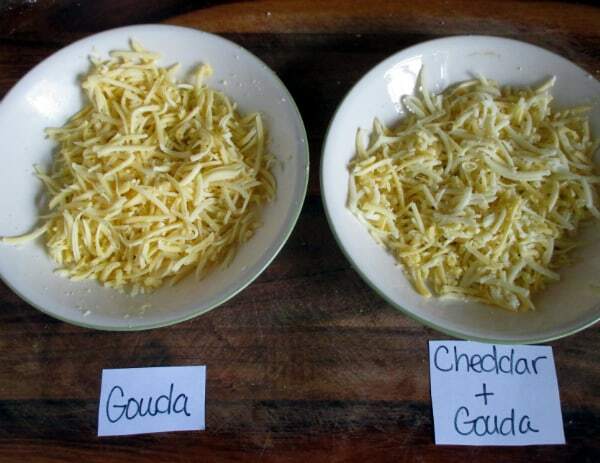 One using 100% red wax gouda and the other using a 50/50 mix of gouda and sharp cheddar cheese. Both of the cheeses I shredded myself. You really don’t find shredded Gouda in a bag and even if you did, I would avoid the already shredded cheese. You will find mold inhibitors and corn starch (most likely GMO) often added to shredded cheese – there is no reason to run the risk of those ingredients being harmful just to save you some time. A simple box grater or even your food processor gets the job done. That way you are not stuck with just using what’s offering in the bags. For both recipes I made a simple roux with 1/2 stick of butter melted, then added 3 tablespoons flour and 1/4 teaspoon mustard powder. Then added 2 cups of milk, and when it boiled, added 8 ounces of cheeses (1 batch of 8 ounce of Gouda and one batch of 4 oz sharp cheddar mixed with 4 oz of Gouda). The 100% Gouda mac & cheese took longer to melt, I had to stir it more to evenly melt the cheese. 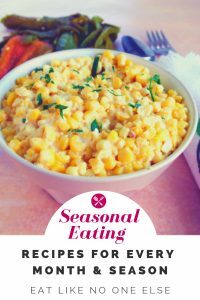 It produced a rich, creamy mac & cheese that I just wanted to gobble up on the spot! The 50/50 mix was good but not as flavorful as the 100% Gouda. My kids still prefer the 50/50 mix over just straight cheddar. Later on I tested how each mac & cheese did being re-heated in the microwave. The 100% Gouda clumped up really badly. It lost any creamy texture it had. Flavor was still there. The mix performed better, still with some clumps since it also has the Gouda in it. 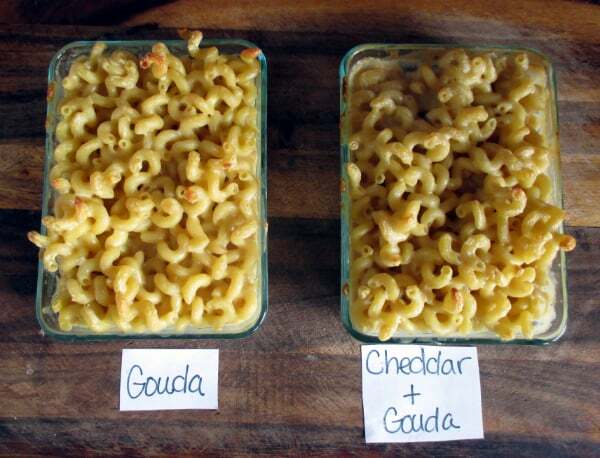 If you want a mac & cheese that is going to perform well reheated then Gouda is not the best choice. 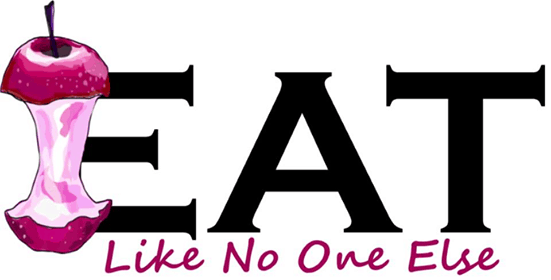 It’s best to use it when you are going to eat the meal right away. What Could Be the Reason My Gouda Cheese Doesn’t Melt? So you have tried this out and found that your Gouda didn’t melt well. What went wrong? Didn’t I say Gouda is a good melter? Keep in mind I also said that are more aged Gouda does not melt well. An older Gouda has less moisture in it. Without the moisture the cheese doesn’t melt smoothly, and it kind of just clumbs. Think about Parmesan. That is a drier, hard cheese and it doesn’t melt. For more on the science of cheese melting check out this article from Serious Eats. They really get the science down. It is a wonderful read I couldn’t possibly improve on. 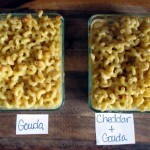 Next time your making macaroni and cheese without the box really go outside the box and go Gouda! You will be glad that you did. Bring 1 gallon of water that has been salted to a boil. Then add pasta. Cook until al dente. Melt the butter in large saucepan. Add the flour, mustard, salt, and pepper. Stir to combine. Cook until all the flour has mixed in and the mixture takes on a little brown color. Add milk. Bring to a boil. Stir constantly for 1 minute. Slowly add in the cheese. Mix until smooth. Pour over pasta. Serve immediately for best results. Or you can bake it in a 350 degree oven for 25-30 minutes to get a nice brown crust on top. Hello. I love GOUDA. 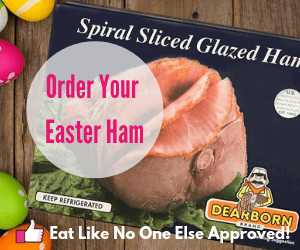 Where can you find Gouda Graskass without ordering online? I live in Alexandria, Virginia The mac & cheese sounds really good.